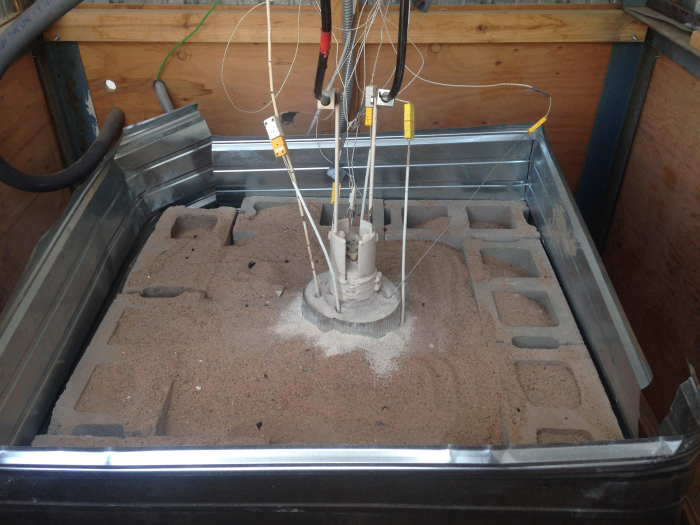 Laboratory test—Host rock has 4-inch drilled core hole and is buried in sand to stabilize temperatures and retain heat. America currently has an estimated 75,000 tons of spent nuclear fuel housed at dozens of locations across the nation that are not designed for long-term storage. The Blue Ribbon Commission on America’s Nuclear Future Report to the Secretary of Energy (2012) identified the urgent need for the U.S. to develop a new strategy for long-term disposal of the waste. Geological disposal of nuclear waste has historically focused on mined facilities. But the deep-borehole disposal (DBD) option has received attention recently because many factors suggest that it is an inherently safe method of disposal. A vital component in the concept is a borehole sealing system able to successfully isolate the nuclear waste. Such a system was the focus of the rock-melt borehole-sealing system (RMBSS) research RESPEC recently conducted for the U.S. Department of Energy. From 2015 to 2017, RESPEC designed and tested an RMBSS system at the RESPEC laboratories in Rapid City, South Dakota. Silicon carbide heating elements were powered by a Spang 1051 SCR power controller, which in turn was controlled by a Campbell Scientific CR1000. An NL120 Ethernet interface was also used to network the CR1000, allowing remote operation and data viewing. In the testing facility, granite boulders and backfill material were used to simulate a borehole environment. Thermocouples (TCs) were used to measure heater, rock, and backfill temperatures at various locations. The CR1000 was initially programmed to operate as a proportional-integral-derivative (PID) controller based on temperature of the heating element and the nearby melt. However, it became apparent that stray voltages (which seemed to develop in the melt at extreme temperatures) were difficult to eliminate, and scrambled the TC data, causing failure of the PID algorithm. The CR1000 was then programmed to slowly step up heater power over several days while collecting temperature data, so as not to induce thermal shock and early fracturing. Twelve tests were conducted, with temperatures exceeding 1,500°C (2,732°F) at the heat source, and the granite melting between 1,100 and 1,200°C (2,012 and 2,192°F). Permeability tests were performed on pre- and post-melt specimens. Long-duration tests (lasting 1 to 2 months) achieved a better melt, with permeability much lower than those measured in pre-test specimens. In 2016, underground tests were performed at the Sanford Underground Research Facility (SURF) in the former Homestake Mine in Lead, South Dakota, 518 meters (1,700 feet) below the surface. Five boreholes were drilled between two levels (the 1550L and the 1700L) to create test zones in rhyolite rock. Hydraulic conductivity tests of the borehole wall were performed within the boreholes to determine hydraulic conductivity at 3-meter (10-foot) intervals. A Campbell Scientific CR300 datalogger was used to collect pressure and flow data during conductivity tests. On the 1700L (below the test zone), a Campbell Scientific CR300 and NL200 network interface collected and transmitted geophone and closure pole data. Geophones were installed to detect potential rock fracturing due to thermal-mechanical stress, and custom closure poles were used to measure displacement of the mine drift. On the 1550L (above the test zone), a CR1000 and NL201 network link were used to control the heater power supply, measure temperatures, and measure water level as water accumulated in the boreholes. Alarms were configured that would be triggered if voltage, current, or temperatures drifted out of range, or connection to the NL201 was lost. Four tests were performed, each between 30 and 43 meters (100 and 140 feet) down the boreholes. This research identified several challenges that must be addressed before the technology can be applied in a deep borehole environment meant for waste disposal. These challenges include withstanding high pressures, and understanding the duration of time needed to create a seal without damaging the rock through thermal-mechanical fracturing.